« Introducing SQL Data Warehouse – MPP in the cloud! With the release of CTP3 SQL Server 2016 and its native In-database support for the open source R language you can now call both R, RevoScaleR functions and scripts directly from within a SQL query and benefit from multi-threaded and multi-core in-DB computations. Yet another SQLServer milestone! The R integration brings a lot of benefits and new scenarios to your end users; it brings the utility of data science to your applications without the need to ‘export’ the data to your R environment! To get started you will need to install and configure SQL Server 2016 CTP3, Revolution R Open (RRO) and Revolution E Enterprise (RRE) on the server. 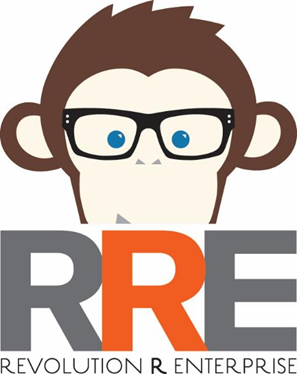 The R integration uses a new service called ‘SQL Server Launchpad’ to ‘launch’ Advanced Analytics Extensions processes; it enables the integration with Microsoft R Open using standard T-SQL statements. 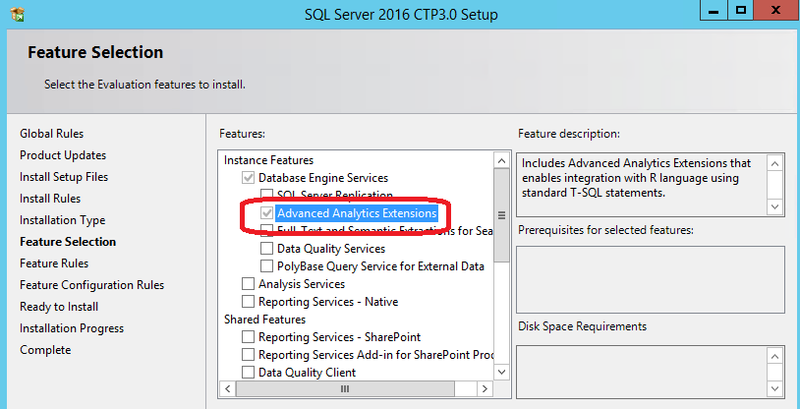 (Disabling this service will make Advanced Analytics features of SQL Server unavailable). 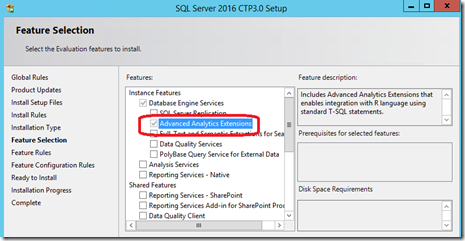 Traditionally you would connect from your favorite R IDE to SQL Server to retrieve data for analytics; or you can use the R GUI environment that is part of the installers bits. The default installation path to RGUI is: “C:\Program Files\RRO\RRO-3.2.2-for-RRE-7.5.0\R-3.2.2\bin\x64\Rgui.exe”. Also popular is the R Studio Desktop that is separate downloadable from: www.Rstudio.com. (the version I installed to get started is V0.99.486). 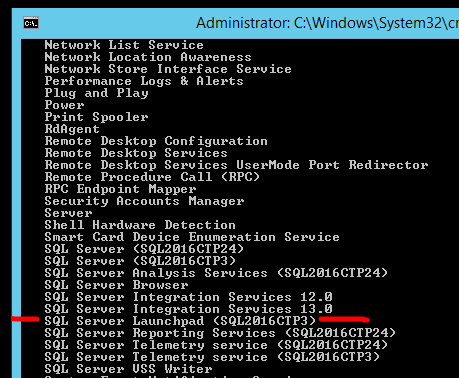 SQL Server will execute this external script via its new launchpad service in the BxLserver.exe process (The Revolution Analytics Communication Component for SQL Server). What would an article about ‘R’ be without a note about memory usage! By default the SQLR integration service in the CTP3 build will use up to 20% of the total physical memory available on the host for all its In-DB running R sessions. You can monitor the Memory usage of the BxLserver.exe process via the Taskmanager Working Set memory column. A ‘R’ script error occurred during execution of ‘sp_execute_external_script’ with HRESULT 0x80004004. Failed to allocate or reallocate memory. The resolution for running out of memory like this would be to increase the max. memory allocation which is a setting in the Rlauncher.config file (which is located in C:\Program Files\Microsoft SQL Server\MSSQL13… \MSSQL\Binn directory). Increase the default setting to a value that is still safe so it will not interfere with the sqlserver memory allocation. Embracing and operationalizing R functionality via the new SQLServer R Services integration has become very simple! It brings a lot of new possibilities to apply advanced analytics to your SQL data, ranging from data exploration to Predictive Modeling. Getting started with R might be a bit challenging but it will enrich your reports for sure! Do you need to have RevoScaleR to use sp_execute_external_script with language = N’R’? – “RRO-3.2.2-for-RRE-7.5.0-Windows.exe” (Note you are installing a special flavor of RRO that works with a specific version of RRE). Excellent! Thanks, Henk! Extremely valuable for those of us on the admin side setting up SQL Server 2016 for developers to explore R integration. In SQL 2016 RC2 it looks like MEMORY_LIMIT_PERCENT is not present in the config. Any idea how to set this?